LEIPZIG, Germany (AP) Hoffenheim coach Julian Nagelsmann will stay one more season with the club before taking over Bundesliga rival Leipzig. Leipzig did not say who would act as interim coach to replace Ralph Hasenhuettl, who quit in May after failing to reach agreement on extending his contract. It is likely sporting director Ralf Rangnick will again take over the coaching role as a stop-gap measure. 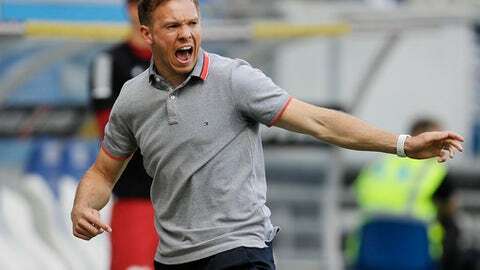 Nagelsmann, the German soccer federation’s coach of the year for 2016, is highly regarded and had been linked with Bayern Munich and Borussia Dortmund last season. Hoffenheim was fighting relegation when Nagelsmann, then 29, took over as the league’s youngest coach in February 2016. He led the club to fourth place and European qualification in 2017 and then third for Champions League qualification this year.